Suitable for all ages of good walkers. 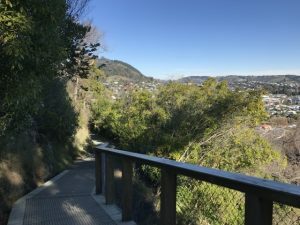 Whether or not this hill is in the exact centre of NZ is certainly debatable but nevertheless, if you can encourage your kids to the top, you’ll feel like you’re on top of the world! (for more on the reason for the centre of New Zealand name, look at this website). The main route up starts at the Botanical Reserve which has a huge grassy area, toilets and a small playground. The map at the start of the track shows lots of paths going up to the summit. The zigzag track is particularly steep but all will test little legs! The beauty is though that it’s reasonably short – less than a kilometre in each direction. A fit adult could be up in 20 minutes, down in less than 10 minutes, with kids in tow allow 30+ minutes and returning within an hour. The paths are mostly shingle and should be fine for sturdy buggies. The bigger problem will be the effort involved in pushing a buggy up the steep tracks! The surrounding bush provides shade in places, depending on the time of day/year. At the summit though there’s no shade at all so definitely take sun hats and block. You’ll also need water for everyone and snacks especially if your kids will need an incentive to keep walking! At the top on a clear day, you’re rewarded with amazing views over the whole of Nelson, the surrounding area and over to the hills in the Abel Tasman. There’s seating and display boards so you can identify what you can see. Address: The Botanical Reserve is on the corner of Hardy Street and Milton Street. 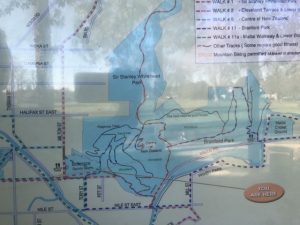 You can get there along the Maitai River walkway. There’s also parking along both streets.